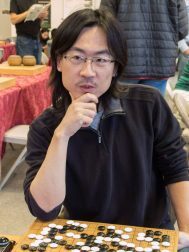 Yue Zhang offers a series of classes to accelerate the learning of players 9 kyu through 6 dan. Classes will meet twice a week for 4 weeks — Wednesday and Sunday evenings, 7:00 PM – 9:30 PM — at the Go Center, beginning June 20, 2018 and ending July 15, 2018. Attend all 8 sessions for the most efficiency in learning (and the most favorable pricing). Yue’s relatively novel classes will be composed of whole-class lectures, games, and game reviews. Compared to traditional teaching which emphasize whole-class lectures, the Advanced Go Class series will focus more on individualized instruction, which will be offered during the games and game reviews. About Yue Zhang: Currently rated 7.8 in the AGA, Yue placed 1st in the 2016 Seattle Anniversary Open and the 2018 Spring Open. Yue holds a PhD from Ohio State University, and he has extensive college teaching experience.